> A random facebook post made me dig out my model 4P which has never worked as long as I’ve owned it, it’s always just sat on a shelf looking cute. > Good old ASTEC PSU problem so I fixed that, reseated all the thankfully socketed chips and it burst into life. Sort of. I know it’s running because I can turn the brightness up to raster lines and see the pattern actually change when RESET is pressed. With contrast right up I can JUST see the boot logo appear while it reads the floppy. > None of the pots on the video board deal with contrast so I’ve got it out on the bench to remove and test the capacitors. What else can I look at at the same time? Someone else has already mentioned the transistors Q101, Q102 and Q103 (on the yoke board). > Screen pic: http://www.binarydinosaurs.co.uk/trs80Model4PScreen.jpg <http://www.binarydinosaurs.co.uk/trs80Model4PScreen.jpg> - you can JUST see the boot logo, I know it’s not screen burn because it does disappear on RESET and comes back again. You might check the contrast control. 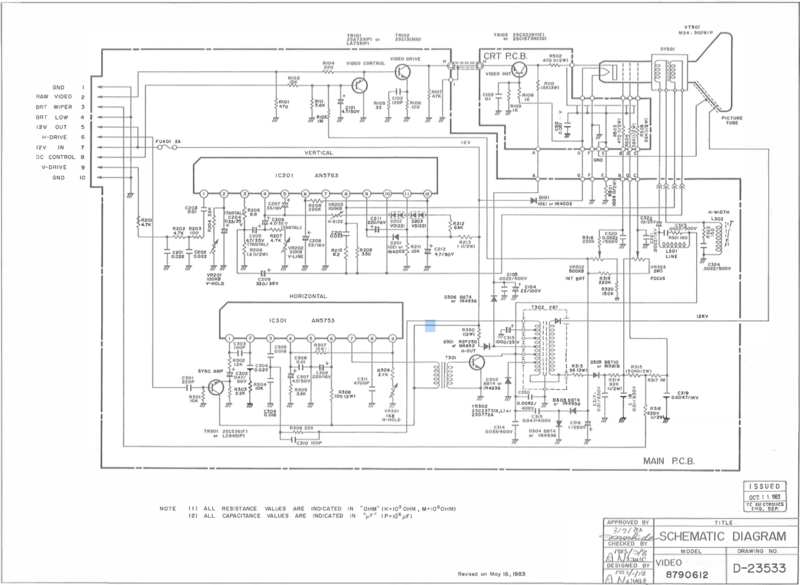 I can't find the actual schematic for the contrast control connections, but I 'm guessing the ends are connected across 12V (video board pins 5 & 1/4/10) and the wiper to video board pin 8. The contrast control can be expected to take pin 8 somewhere + to get pixels fully on. Or get back to us with some voltage measurements at the BCE of TR101, 2 and 3, and at the external connections to the little board on the end of the CRT. Note that there will (should) be several hundred volts on some of those CRT board connections. Does the "internal brightness" control on the video board have some effect?